My last post generated some heated push back from the hard-money types. That post showed the Fed sill has about the same share of treasuries, 15%, as it did before the crisis. Thus, the large run up in public debt over the past four years has been funded mostly by individuals, their financial intermediaries, and foreigners. The Fed has not been the great enabler of the government deficits as claimed by the hard-money types. This fact seems to have been very uncomfortable for them because they largely ignored it. Instead, they quibbled with my definition of debt monetization and resorted to ad-hominen attacks. Given these responses, it is probably too much to hope for further meaningful engagement with them. But in the event some are still listening, here are some additional points I hope they consider. First, safe asset yields across the globe have been falling for the past four years. Even more remarkable, is that the yields have been falling in a similar pattern. This can be seen in the figure below which shows the long-term government yields for Canada, Germany, Japan, the United States, and the United Kingdom. U.S. monetary policy cannot explain this worldwide phenomenon. It was already hard to explain the decline in U.S. yields by looking to U.S. monetary policy. The Fed only holds about 32% of long-term treasuries and the long decline began well before Operation Twist. The similar decline among all these different long-term government interest rates only further undermines the view that Fed is enabling the low U.S. treasury yields. A much simpler explanation for the low interest rates is the ongoing economic slump that keeps the demand for safe assets elevated. Second, the Fed and U.S. Treasury Department have been pursuing opposite objectives with regard to the maturity of the publicly-held debt. The Fed has been trying to shorten the maturity with Operation Twist while the Treasury Department has been trying to extend it. The figure below sums up this tension nicely. It shows the average maturity of marketable debt has been growing and is projected to grow more. Thus, the Treasury is offsetting the Fed's Operation Twist efforts and will continue to do so. Surely if the Fed was working to enable the budget deficits it would coordinate with the Treasury department. Third, even if the Fed were responsible for the low yields it has failed to generate upward inflationary pressures. For four years hard-money types have been warning about inflation exploding. This has not happened and indicates that treasury yields are not being held below their natural rate level, the interest rate consistent with the economic fundamentals. This indicates that should the Fed preemptively raise interest rates, as some have suggested, it would not spark a recovery but choke the already weak economy. Fourth, the hard-money types have overlooked the safe asset shortage problem that has emerged over the past few decades and its implication for U.S. treasuries. Over this time the global economy has grown much faster than its ability to produce safe assets. As a consequence, the world has been turning increasingly to the U.S. financial system to create safe assets, particularly U.S. treasuries. This means the demand for U.S. debt is higher than would otherwise be the case. It also means for the world financial system to operate smoothly it needs the U.S. government to run budget deficits. A failure to do so will only drive safe asset yields lower and intensify the all the problems associated with low interest rates. The crisis has only intensified this development. This means that the rest of the world may continue to enable our budget deficits for some time. Finally, my view of debt monetization is that it occurs when monetary policy causes the stock of money assets to unexpectedly exceed the real demand for them. When that happens, the resulting inflation will be higher than anticipated and erode the real burden of the public debt. This increase in the money supply may also temporarily push interest rates lower and reduce the government's financing costs. Note, though, for there to be debt monetization it is not enough to say the Fed is purchasing treasury assets. Such purchases could simply be keeping the money supply in line with real money demand. Asset purchases by the Fed, therefore, do not necessarily lead to debt monetization. In fact, the evidence currently points to the opposite problem, an excess demand for money assets. The Fed is facilitating the government’s massive deficit spending by lowering the government’s debt service costs and by neutering market discipline on fiscal policy... the Fed is effectively preventing the fixed income markets from sending out warnings about fiscal policy and disciplining policymakers. The “bond vigilantes” of the past that effectively disciplined Washington have been pushed to the sidelines. The old adage “don’t fight the Fed” certainly rings true when the Fed is the biggest holder and purchaser of US Treasury bonds, signals its intentions to keep bond yields low until labor markets improve significantly, and expresses its tolerance—and even advocacy—of a rise in inflation above its stated target. These type of wild claims that point to debt monetization simply do not stand up to the data. I agree we need a conversation on what the Fed should be doing, but before we can even do that we need to have our facts right. Here is hoping this post is a push in that direction. What is your response to the explanation that because of monetary stimulus, prices have been prevented from falling. Deflation wasn't allowed to go through and make a new recovery possible. Purchasing power of citizens has been eroded, whether it then has been helping governments or not. Precisely. Without monetary stimulus prices would have been falling due to deflation. Thus the correct measure of the impact of the vast monetary stimulus on inflation is the difference between the deflation or negative inflation which has not been allowed to occur and the positive inflation which has been recorded. (1) Can you link to some of the ad hominem attacks? I'm not denying they occurred, I just want to see what you mean. (2) Are you saying that if the Fed sold all of its Treasury holdings, the yield on Treasuries wouldn't move? What if the Fed sold all of its MBS holdings? Would the same thing happen there, or do you agree that when the Fed says, "We are buying MBS to lower interest rates and induce people to spend more on housing," that the mechanism works for that asset? Bob, on (1) see comments at Zero Hedge. On (2),treasury yields would move but not a lot. My sense from reading the empirical literature on LSAPs is that it would be less than 1%. That does not explain most of the long decline in yields since 2007. Some like Michael Woodford would attribute even less influence to the Fed. In terms you will like, I see the treasury yields largely being driven toward the short-run natural interest rate level. You see the Fed pushing treasury yields below the natural rate. We both agree the the Fed did that in the early-to-mid 2000s. We disagree that it is doing it now. Unless you're claiming that *any* nominal income growth over 1%/annum is "monetary stimulus", then we only 'should' have seen deflation over the past 4 years if we've either seen (faster than usual) rising productivity or positive supply shocks. I think it's quite obvious that neither of those scenarios describes the actual situation over the past 4 years. If anything, due to slack productivity growth and negative supply shocks, we should have seen higher than usual inflation over the last 4 years, and tight money has been preventing that from happening. Good post. Even as hard money types focus on the dangers of monetization, they have not considered enough of the supply side reasoning which matters most: finding ways to better match wealth creation with services provision and actual consumer needs - i.e. the real challenge of nations in the near future. Until we can do that, we all need the safety net of debt monetization. I'm not familiar with your blog and was confused by the reference to "safe assets" and in particular to the idea that safe assets are produced by governments. So I clicked over to your July 25, 2012 "safe assets" post and I am familiar with Gorton and Singh's work. I think that the link that's missing here (and in Gorton and Singh) is that monetary safe assets are created by the private sector not the public sector. The public sector can have a relatively small role to play in stabilizing private sector monetary assets by supporting the private sector through short-lived (i.e. measured in weeks, not months) liquidity crises, but anything more than this degrades the private sector monetary asset creation process (often discussed in the context of moral hazard). What we're suffering through now is the apotheosis of excessive public support of the private sector monetary asset creation process, that has all but destroyed it. So of course we have a "safe asset"/monetary crisis. But the idea that more public intervention can address it is, as many have observed, like arguing that the best cure for a hangover is more alcohol. What we need is to regenerate the process of private sector monetary asset creation, but that requires resetting a broken incentive structure and significant institutional reform. Claiming that never-ending public sector monetary asset substitution is "the cure" is derived from your (and Gorton's) misdiagnosis of the problem. Public sector monetary asset substitution may be justified as a means of easing the pain of the institutional changes required by a true cure, but misdiagnoses like yours make it less likely that the true cure will ever take place and more likely that we stumble from crisis to crisis. "monetary safe assets are created by the private sector not the public sector". Really? So I assume your protfolio prior to 2007 was composed mainly by absolutely safe Lehman Brothers shares with no unsafe treasury bonds at all. Hence you must be now in misery. But have no fear: given that the private sector can create monetary assets, as a private you can always print your own money, that your butcher will certainly be happy to accept over the unsafe green bills created by the US government. Financial sector liabilities in the form of bills, letters of credit and deposits have been monetary instruments, since the time that government debt was issued by kings and the idea that it was safe was patently ridiculous. Even in the 1870s and the Depression depositors' losses were very small. The problem in the Depression was not losses to depositors but losses of bankers' assets that crushed the capacity for financial intermediation. With respect to Lehman, my answer was here: "excessive public support of the private sector monetary asset creation process, that has all but destroyed it". The financial sector (and in particular bondholders of financial institution) expect government bailouts -- and have since 1982 -- that's why Lehman was allowed to take on the risk that resulted in its failure. Anonymous, my preference is not to have more public safe assets but private ones. That would imply a recovery is under way. The problem is that demand for private safe assets and the supply of them have fallen. Consequently, the public sector is filling the gap. This has been true in past recessions. One reason I am a big fan of NGDP targeting is that I believe it would catalyze the private sector into producing more safe assets. this post for more. What i want to know is where you stood during the eight years of bush's deficits and were you one of the people trashing him for 400 bl dollar deficits. I'm not going to go back and look at your record, but i have noticed in general that the same folks who couldn't stand bush's much smaller deficits are now gung ho on 1.5 trillion and "preferably larger" deficits and have even come up with their new mmt for the fed to help accomadate it. Keynesians want counter-cyclical fiscal policy. Bush's deficits were extremely pro-cyclical, Obama's are (at least to this point) counter-cyclical. There's nothing inconsistent about that. Some actually praise Bush for running fiscal deficits and creating safe assets. Austrians are not interested in facts or evidence, they only base their view of the world on a priori truths. Anything that appears to contradict what those a priori truths would suggest are simply being misinterpreted. BTW, the fact that I may or may not agree with this post does not stop it from being excellent blogging. It means Beckworth has a different point of view from mine, and I might learn something from reading his. I fall on yet another side of this argument. I think the Fed should be monetizing the debt, and a lot harder than it is. I have no problem with debt monetization when we hit zero bound, and inflation is microscopic, like now. If debt monetization does not lead to inflation (and $2 trillion and counting it has not) then I say go in big. We can pay down the national debt and stimulate the economy. And if moderate inflation develops---say 5 percent---all the better. We deleverage ourselves and all debtors. Inflation or deflation or steady state prices---if such things can even be measured---are not theft. Theft is the government creating conditions that crimp real economic growth. Like the Fed is doing now. I agree with the above comment, excellent blogging. Really interesting. The name callers who have nothing interesting & valid to say really stand out. Yes to Benjamin-print, baby, print! But I think printing more money to pay all Federal entitlement spending and wages, for instance, is more Treasury / fiscal policy, than a Fed monetary policy. The point is that MV=PQ, and V is low, so the gov't should go ahead and increase M1 base money without borrowing it, by printing it. It should announce a program of printing $20 bil a week ($1 tril/yr), until inflation is up to 5%. The Federal Reserve’s System Open Market Account (SOMA) portfolio — that is, its holdings of securities – more than tripled from 2008 to today, and in June 2012 exceeded $2.6 trillion. The Fed is buying 60% plus of all Treasury debt issued in the secondary market at this moment and plans to buy $1 trillion plus in 2013. The Fed is the marginal buyer right now and absolutely is THE buyer holding rates down. The banks are not loaning so the newly created money is being parked on banks' balance sheets and back at the Fed as reserves. If the Fed paid 0% on those parked reserves, all hell would break loose (where would the banks go). The banks earn money for doing nothing and we get the short end of the stick in our checking/saving accounts. It's a wealth transfer from the people to the insolvent banking system through dollar devaluation. This is a type of ponzi scheme that will break at some point. I do agree that the Fed is not directly responsible for the fiscal deficit. Congress is responsible for that. Congress could stop the spending, but won't/can't, and they could also stop the money printing in one vote if they wanted get rid of the Fed, but no one will do it because they love having the Fed around to buy their worthless bonds. It's all a joke. It's QE to infinity. Any institution that has to come up with a name like "quantitative easing" is obviously trying to fool a majority of the country that don't understand a fiat system backed by no real assets. In the end we don’t need central bankers making decisions based on inflation targets, money supply targets, etc. We need a market based system that allows “good deflation” from productivity and technology breakthroughs to occur, and gov’t that manages their balance sheet like a private sector company. Then we would avoid too much debt and have a much more stable system in the LONG RUN. But politicians are all about the short run - getting re-elected and increasing power. What bothers me the most is that few people challenge the system itself. I don’t believe in the current system anymore. I prefer a true gold standard that allows a currency to depreciate and appreciate based on a country’s performance. A fixed money supply backed by real assets is the only answer. If we have a robust economy and net exports, then the currency should strengthen which naturally slow down exports and vis versa (and when the currency strengthens, the country has to buy gold with the extra reserves). We need to let the markets dictate rates and money flows through gold purchases/sales and not central banks. I think the explanation in Rickard’s Currency Wars (e.g., the 1800s and the unwritten rules in the gold standard market) makes sense. When the countries followed the rules, it worked. When governments spent too much on “guns and butter”, they broke from the gold standard or played other games thinking it would fix their problems. It ended up creating long term problems and unintended consequences. The politicians and central bankers don’t want to play by fair, market based rules. In the long run we all lose. We must get rid of debt-based money and cleanse the system of the need to have exponential growth of debt-based money to keep paying interest on new credit money created out of thin air. We don’t need more money in the system. What I call a “managed ponzi scheme” must end. Until it changes, we will continue to have bubbles, busts and currency wars until we completely overhaul the system. Yes, getting money into the system will help in the short run, but it won’t solve the structural issues. The pendulum will just keep swinging back and forth too far and the central bankers and governments will continue to extract from the people in both directions. The world won’t end, but wealth will continue to transfer generally in the direction away from those that don’t understand the system and/or don’t know how to protect themselves. Physical gold/silver are the ONLY currencies with no liability attached to them and they insulate you from all the noise about whether our system is good, bad or indifferent. JMHO of course. I highly recommend the book "Currency Wars". Everyone in the country should read it. We are in the middle of one of the biggest currency wars in history and it won't end well. "Even more remarkable, is that the yields have been falling in a similar pattern. 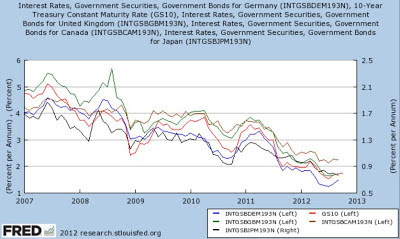 This can be seen in the figure below which shows the long-term government yields for Canada, Germany, Japan, the United States, and the United Kingdom. U.S. monetary policy cannot explain this worldwide phenomenon. " to what extent, if any, do you think that the 24 -7 world wide trading algos have on rates? me thinks that as time passes, the electonics compress the range, and a basket of many named gov debt effectively a one world 'dollar' bill.